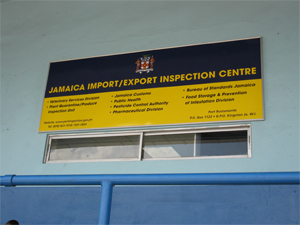 The Jamaica Import/ Export Inspection Centre (JIEIC) has reduced turnaround time for the inspection of commercial goods coming into the country from an average of twenty-four (24) hours to an average of four hours. The Centre has exceeded its initial target of a six hour turnaround time, and is moving to reduce inspection time even further. The Centre, now in its sixth year of operation, has brought together in one location all regulatory agencies responsible for inspection and clearance, no longer requiring clients to visit multiple agencies in various locations, which could often take in excess of twenty-four (24) hours. The JIEIC makes accessible to clients the services of the Ministry of Agriculture and Fisheries (Veterinary and Plant Quarantine Divisions); Ministry of Health (Public Health, Pesticide Control Authority and Pharmaceutical Division); Ministry of Industry Investment and Commerce (Bureau of Standards Jamaica, Food Storage and Prevention of Infestation Division); as well as the Jamaica Customs Agency. More recently, the JIEIC has established a dedicated customer service area to assist clients with preparing documentation and to clarify processes to prevent delays in carrying out inspections. Customs Brokers representing major companies are lauding the facility for delivering exceptional customer service, and for eliminating the hassle of travelling to multiple agencies to complete inspections. Frederick Lyeow, a Customs Broker with major clients including PriceMart Jamaica Limited, which requires him to be at Berth 11 five days a week, has expressed his enthusiasm about the One Stop Shop, saying that it is a “brilliant idea to get those bodies together under one roof”. Customs Broker Charmaine Reid, who visits the One Stop Shop on a daily basis, reports that “once all officers are there, I am usually processed within ten minutes”. Returning residents transporting large volumes back to Jamaica also utilise the facility and are pleased with the expedited process. The Montego Bay branch of the JIEIC is being established and is expected to be open for operations in 2016. The site has been identified at the Montego Bay Port, and plans are being finalised for retrofitting an existing building. The JIEIC which started as a public sector modernisation project led by the Ministry of Agriculture and Fisheries is among the suite of projects with national impact which are supported by Office of the Cabinet, which has a responsibility to strengthen public sector institutions to deliver more efficient and effective public goods and services.